It has been a fantastic growing season in Moab. Laden fruit trees, happy gardens and a happening farmer’s market lend a sense of bounty. The arrival of September, with its shorter days and cooler nights, marks the start of the fall harvest season. Whether you are a gifted gardener, a weekend hobbyist, or a total horticultural slacker, there are plenty of venues around town to avail yourself of beautiful locally grown food. One of the best places to frequent is the Moab Farmer’s Market. 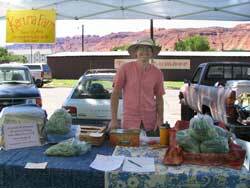 The Moab Farmer’s Market takes place on Saturdays, May-October, 8-noon, at Swanny City Park. Gayle Weyher, the Farmer’s Market Manager, describes it as a real Moab event, and offers much more than food – you can find wares from local artisans, listen to local musicians, get your bike checked out, listen to children’s storytelling, and the list goes on! Some of the regular produce vendors at the Market include Manzana Springs Vegetable Farm, the Youth Garden Project, and Karuna Farms. September will also feature Palisade Peaches and Chuck Peterson melons from Green River. During the month of September Manzana Springs will have abundant quantities of tender salad mix, sweet basil, crisp cucumbers, juicy luscious tomatoes, tasty summer squash, crunchy sweet peppers, nine unique varieties of garlic, fresh walla walla onions, a selection of cooking greens and many other crops. Fall vegetables such as sweet carrots, beets, broccoli, storage onions, kale and collards will start to be available towards the end of the month. Manzana Springs Vegetable Farm, whose mission is to provide fresh healthy produce to the local community while caretaking and improving the land, is run by Chris Kauffman and Adrea Lund, with the help of four employees and lots of volunteers. They describe their produce as “beyond organic.” because in addition to using only organically approved fertilizers and pesticides, and following sustainable agriculture practices such as cover cropping and crop rotation, their produce is always extremely fresh and sold within four miles of where it is grown. The Youth Garden Project will be offering tomatoes, cooking greens, chard, kale and a good selection of herbs, including everyone’s favorite, basil. They also will have eggs and various jams and chutneys. The Youth Garden Project is a well known Moab area non-profit that uses organic gardening, education programs, and community service to promote personal growth, self responsibility and community awareness in local youth. On the corner of Main Street and 100 North, you will find the produce stand of the Castle Valley Farms. They are having a great melon harvest this year, and you can find squash, cucumbers, tomatoes and pepper as well. The Moonflower Market, a non-profit community food store located across from the post office, makes a point of selling as much local produce as possible in season, and offers regional honey and bee pollen. They carry Manzana Springs and Youth Garden Project produce, and purchase from other local and regional gardeners. One of those is Jon Olschewski, who grows on a sunny, sandy loam parcel in Spanish Valley. He wants everyone to know that sandy loam is great for root crops, and has hefty potatoes and large carrots to prove his point. You will find his bell peppers, tomatoes and carrots at Moonflower, as well as a sprinkling of other items from his garden. He is someone who loves to support garden culture in general and plans to offer plant starts next spring. 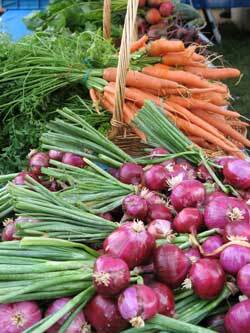 Following are some recipes to guide you in preparing and enjoying the fall harvest. Combine the basil in with the walnuts, pulse a few times in a food processor. Add the garlic, pulse a few times more. Slowly add the olive oil in a constant stream while the food processor is on. Stop to scrape down the sides of the food processor with a rubber spatula. Add the grated cheese and pulse again until blended. Add a pinch of salt to taste. You can store in the refrigerator for one week. To freeze pesto, pour into ice cube trays to make “pesto cubes” that will be easy to use later! (Thanks to the Youth Garden Project for this recipe). Heat olive oil in a deep skillet or dutch oven. Add garlic, onion, and bay leaf and saute over medium heat for about 5 minutes. Add eggplant, salt, and herbs and stir. Cover and cook over medium heat, stirring occasionally, for 15-20 minutes, or until the eggplant is soft. Add zucchini, bell peppers, black pepper, and tomatoes. (Break the tomatoes into small pieces with a spoon.) Cover and simmer for about 10 more minutes, or until the zucchini and bell peppers are tender. Serve hot or at room temperature - plain or over rice, topped with parsley and/or olives. Delicious! In a frying pan cook the summer squash in the oil - season with thyme, salt (don’t add too much - the feta cheese which goes on top can be very salty) and pepper. Chop the olives and cherry tomatoes into halves. When squash is tender pour over pasta and top with the cherry tomatoes, black olives, and feta cheese. Adjust the seasonings and serve.